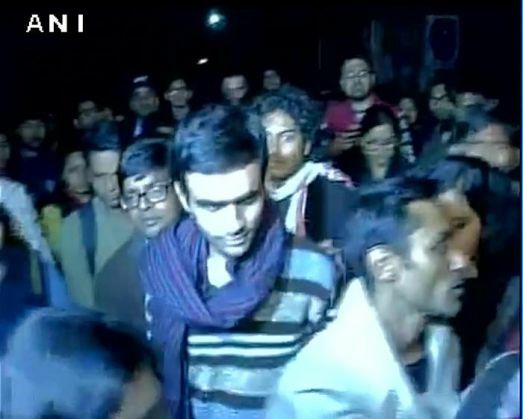 Following the voluntary surrender last night by Jawaharlal Nehru University students Umar Khalid and Anirban Bhattacharya, who are facing sedition charges, Khalid's counsel has called on the Delhi Police to ensure his safety. The students left the University campus late last night and entered a JNU security van, where the police were waiting for them. According to sources, the two students were questioned by police for around five hours and medical tests were carried out on them. The two have been placed under police custody at South Campus police station and are likely to be produced before a magistrate today. "It is the magistrate and the police's duty to ensure Umar's security so that what happened with Kanhaiya, does not happen with him," Khalid's counsel Kamini Jaiswal told ANI. She said that before interrogating Khalid, the police must at least verify the authenticity of the video clips in which Khalid can allegedly be seen raising anti-national slogans at an event to mark the hanging of Afzal Guru in the JNU campus on 9 February. Khalid and Bhattacharya are among the group of students who allegedly shouted anti-national slogans at an event organised in the university campus on 9 February. On 20 February, the Delhi Police issued a look out notice for the two students as well as Rama Naga, Ashutosh Kumar and Anant Prakash.